Visitors to 2010 International Poultry Expo in Atlanta can request quotes for and samples of poultry packaging from Interstate Container Cambridge. Interstate Container Cambridge is exhibiting its wax alternative poultry packaging at the 2010 International Poultry Expo, Booth #5575, from 27 - 29 January 2010 at Georgia World Congress Center in Atlanta, Georgia. The International Poultry Expo is the world’s largest trade show for the poultry and egg industry. Interstate Container Cambridge looks to transform the poultry packaging industry with the development of its patent-pending GREEN COAT™, a 100% recyclable and cost-effective wax replacement. The corrugated plant's FBA-certified GREEN COAT™ boxes are recyclable, repulpable and compostable. They meet or exceed most current wax box performance, providing proven moist condition tolerance. 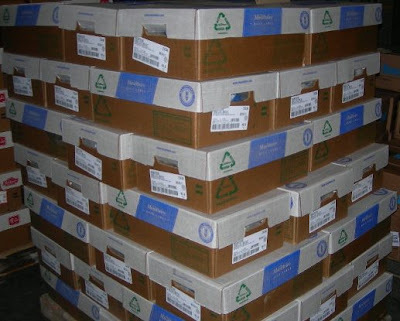 These cartons can significantly help poultry processing plants in their environmental and sustainable efforts while saving their customers disposal fees. Interstate Container Cambridge, located in Cambridge, Maryland, is a member of Interstate Resources Container Division and a partner in Global Green’s Coalition for Resource Recovery.